Is there a better alternative to Loan Calc? Is Loan Calc really the best app in Finance category? Will Loan Calc work good on macOS 10.13.4? Loan Calc is an easy-to-use tool intended to calculate loans and mortgages repayments in a very simple way. It calculates repayments amount, monthly and total interest, and total repayments, and generates a full repayment list from a start date. Loan Calc is currency-independent so it can be used with any currency. Just use a dot or a comma for decimals, depending on your system settings. The macOS version is now 64-bit. Loan Calc needs a review. Be the first to review this app and get the discussion started! Loan Calc needs a rating. Be the first to rate this app and get the discussion started! Loan Calc lets you select both period and interest compounding from continuous (compounding only), weekly, biweekly, monthly, quarterly, semiannually, and annually. 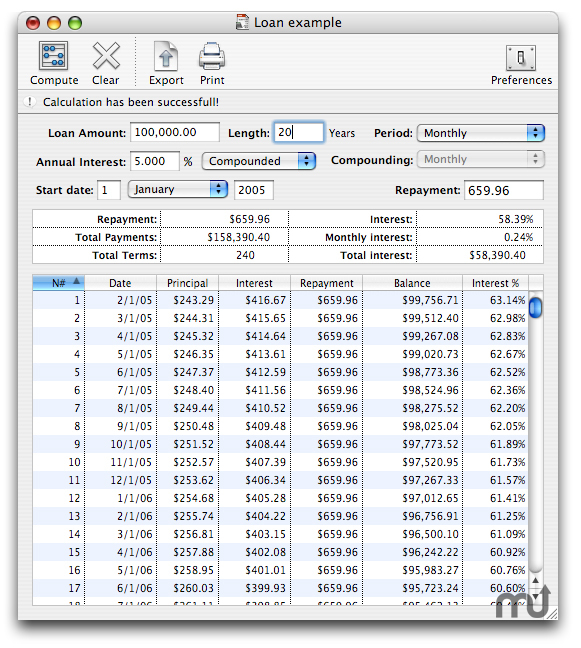 Furthermore Loan Calc allows you to save all the repayment list to a text file or an Excel sheet. Native versions for OS X and Windows.